We value your feedback and look forward to receiving your questions and suggestions. 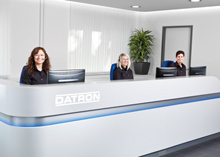 Following please find all general press releases issued by DATRON AG. Corporate news from the Investor Relations area of our business are published in German only and can be found in our dedicated website space. May 11, 2017 DATRON AG gibt die testierten Geschäftszahlen 2016 sowie die Zahlen des ersten Quartals 2017 bekannt. Erweiterung des Aufsichtsrates geplant. September 12, 2016 DATRON Uses Smartphone Approach for New Milling Machine - "Smart Milling"
July 18, 2016 DATRON neo: Simply plug and mill. July 14, 2016 Smart Milling. DATRON revolutionizes CNC machining. May 11, 2016 Successful SMEs with high fan-factor: DATRON AG again among "Germany's Customer Champions"
July 20, 2015 „Im Zeichen der Lilie“: DATRON AG partners with SV Darmstadt 1898 e.V.